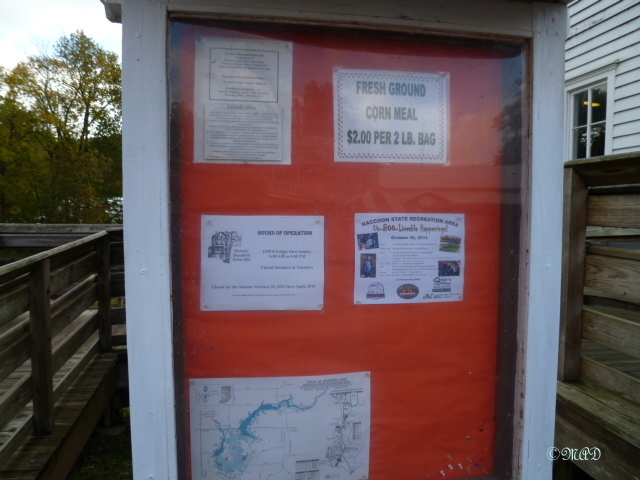 The Parke County Covered Bridge Festival is a much loved traditional event that has been celebrated every October since 1957. The event starts at the county seat, Rockville, with booths of crafts and food and spreads out across the county and takes place the first two weeks of October. 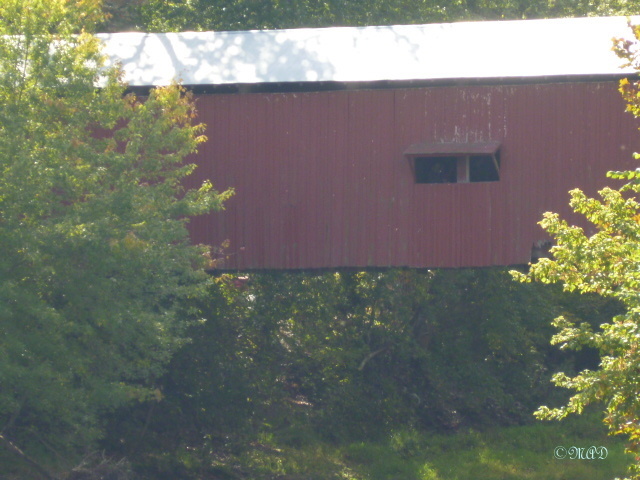 At one time there were at least 53 covered bridges in Parke County, but now there are 31 in existence and 10 of those are not open to vehicle traffic. 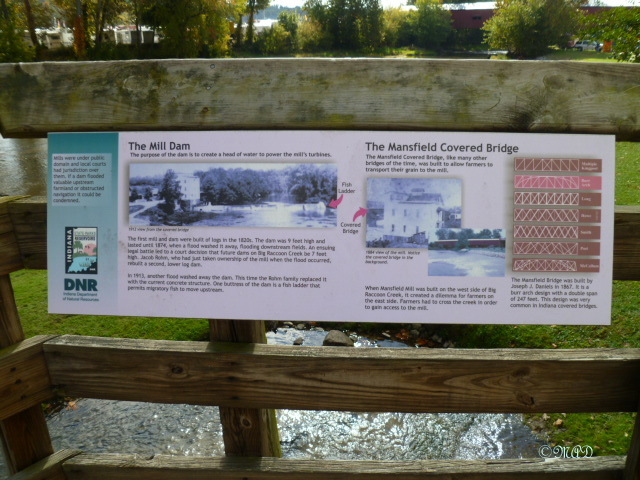 Mansfield Bridge built by J. J. Daniels in 1867 over Big Raccoon Creek. Folks line up to walk through the bridge. Down underneath, an area for children’s activities. 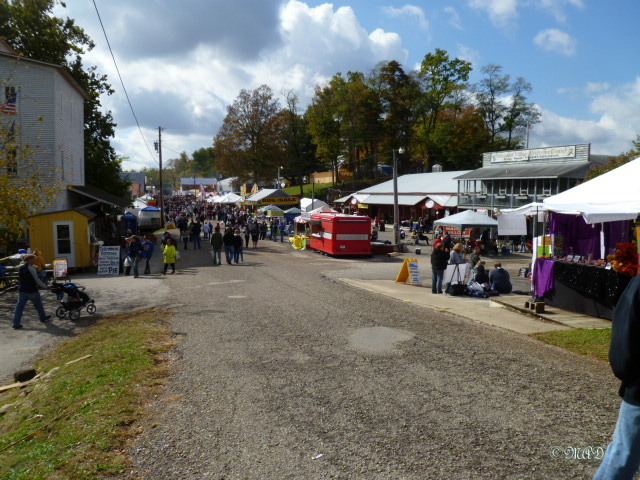 Folks come from miles around to see the many historical covered bridges in the county, visit the center of Rockville, Indiana, shop at the many roadside stands and booths, and taste delicious Autumn inspired foods. 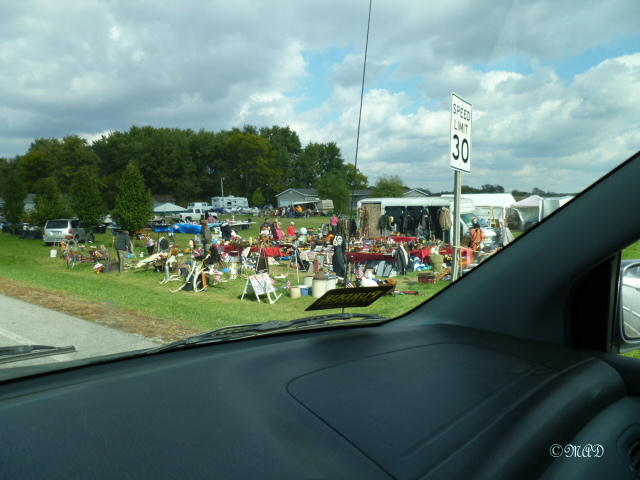 Also, area families set up yard sales and craft bazaars along the streets and roads. This is a hugely popular festival and claims to be the largest of its kind in the nation and this was it’s 57th year. It makes a great drive through the Indiana countryside while the fields are being harvested and the tree leaves are turning beautiful colors. Roadside booths & tents line many of the county roads. 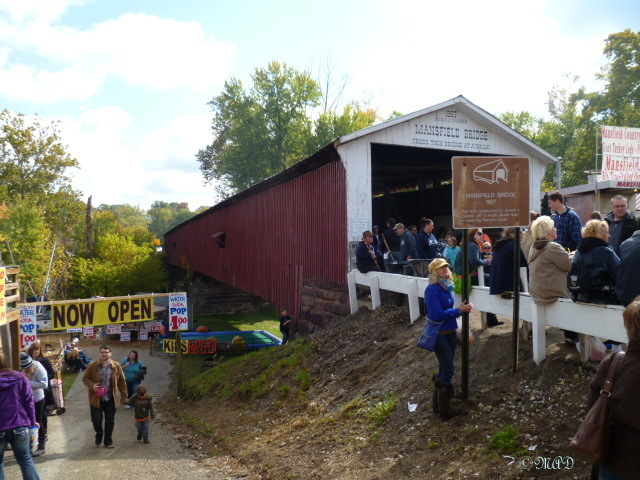 I decided to drive to Mansfield, Indiana where one of the old covered bridges is located and is the site of a huge set up of booths, tents and food venues. Huge doesn’t quite describe it, maybe massive is a better word. The booths went on for what seemed forever and there were hundreds of people everywhere. My photos don’t quite express how many people there were. But despite the number, the crowds flowed along and I never really felt bogged down in my progress through the festival. 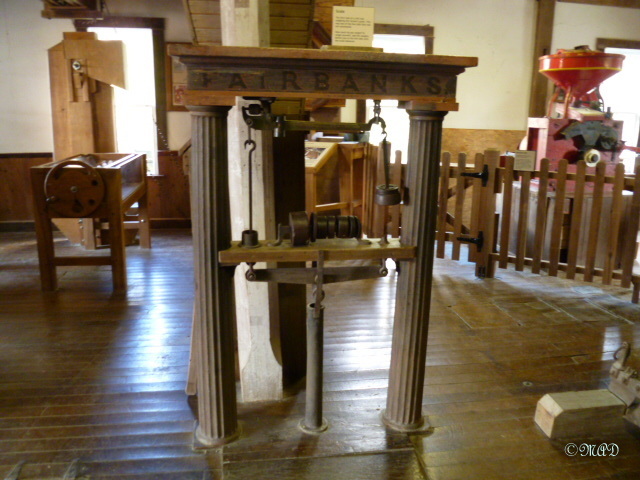 Ice cream prepared with an old antique engine providing the churning power. 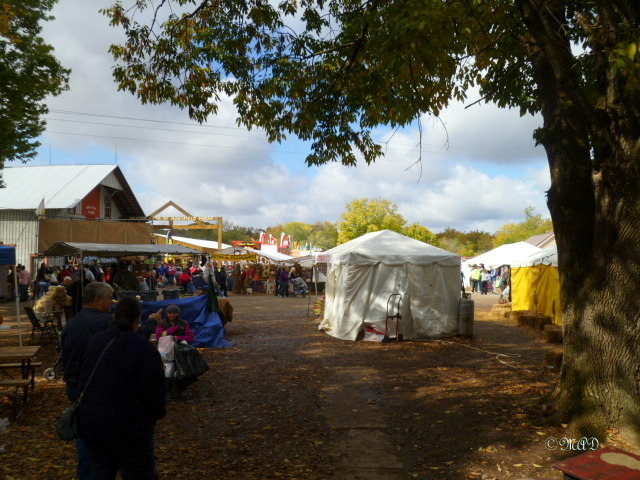 Looking down the main avenue, past the mill on the left, one can see in the distance, there were hundreds of people enjoying the festival. Persimmons – a special Autumn treat in Indiana. An antique store ready for the upcoming Christmas season. 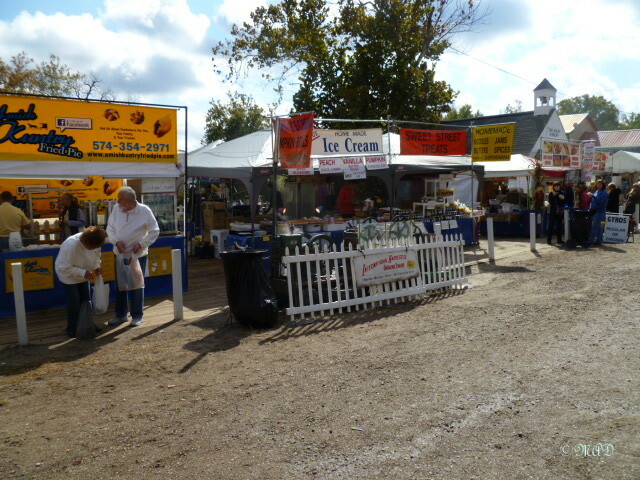 Rows and rows of booths and tents full of merchandise and food. 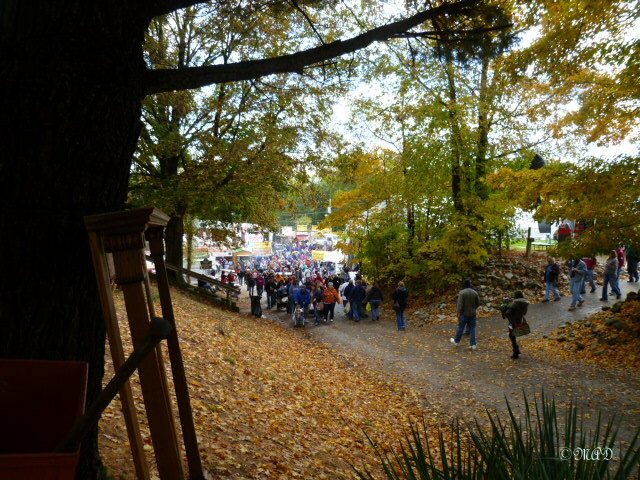 Looking down from the antique store – to show just how many people are here for the festival – hundreds! Years ago, as a young newlywed, I came to this festival when it was a new novelty and it was much smaller. 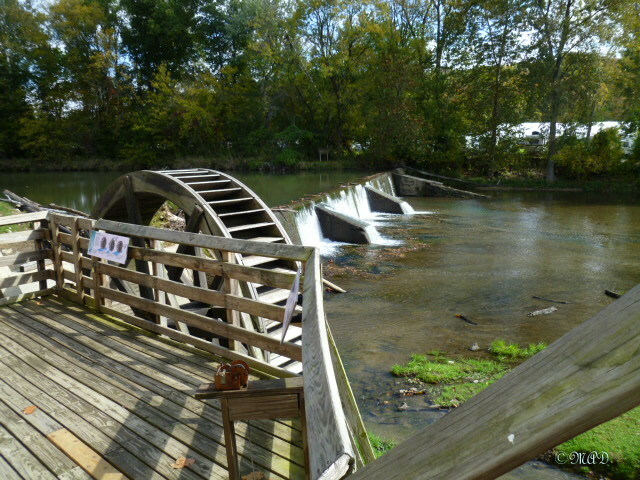 The items for sale were all hand made by Indiana artisans and the bridge was easy to view and walk through. 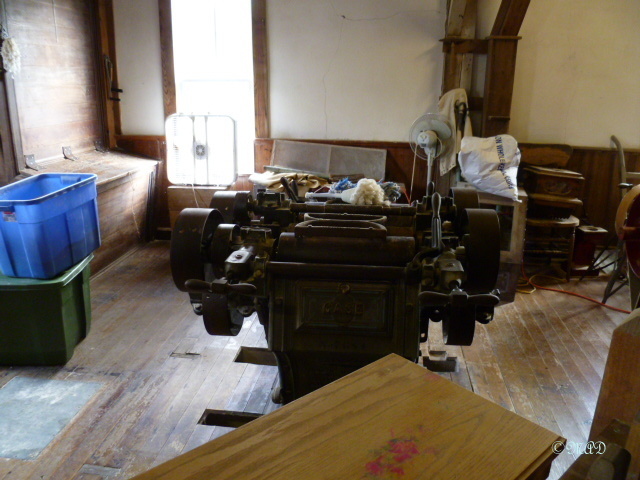 There was an old general store here too, with wooden floors and old fashioned grocery items for sale. 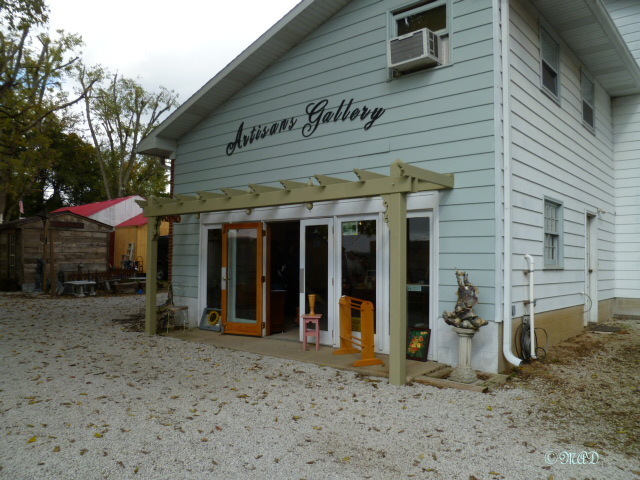 A gallery where local artisans display and sell their creations. This trip, though, I found there were many kinds of merchandise, very little of it made by local artisans. 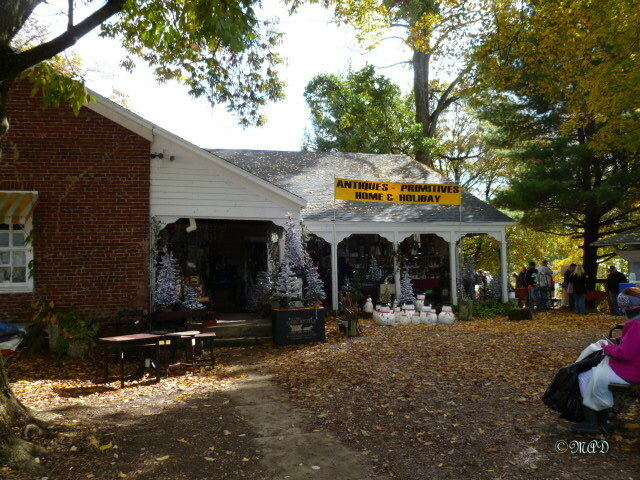 There were handmade crafts, yes, but the kind you would find in bulk at Hobby Lobby or other big outlets, and tents of clothing, sweatshirts, socks, perfumes, gardening objects, wooden plaques, scarves, purses, bags, farm tools, almost anything and everything – items that I could find at the local Walmart. If you’re looking for a bargain, you can probably find it here. People bring their own handcarts to fill up with purchases. 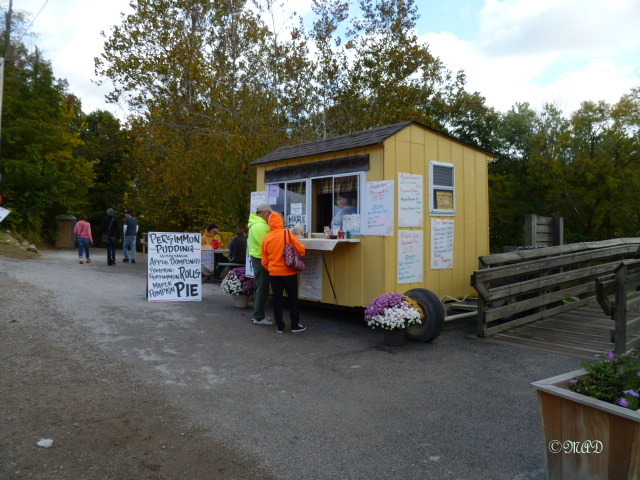 Food venues were pretty much ‘fair’ food – elephant ears, steak sandwiches, popcorn, corndogs, hamburgers, corn on the cob, fudge, cookies, and the list and tents went on and on – most to be eaten on the move, with few places to sit. 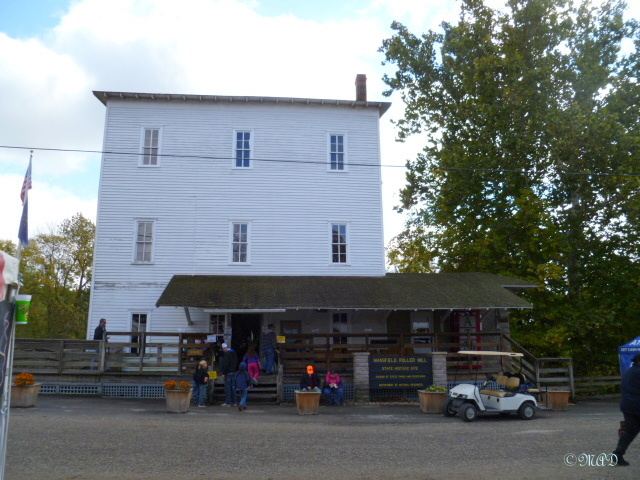 The Mansfield Roller Mill Museum. 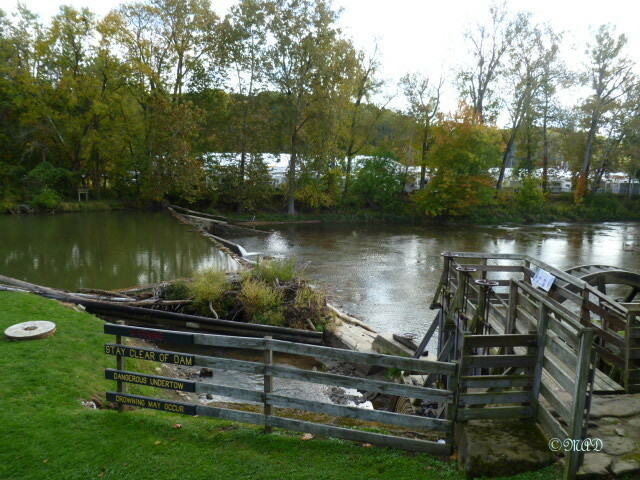 The dam & waterfall which provide water to turn the wheel. 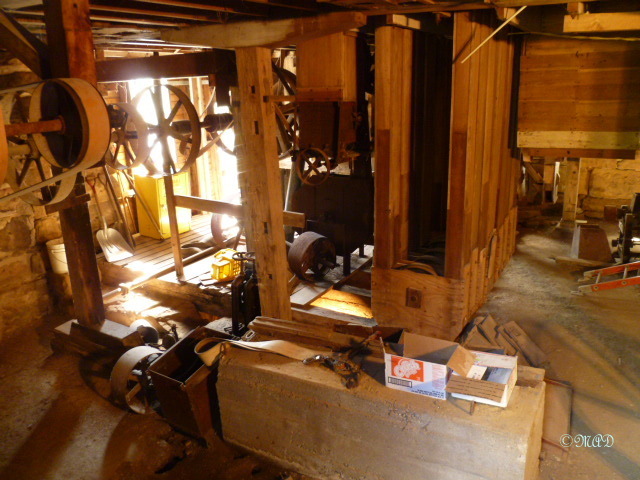 Looking down from the 3rd floor of the mill. 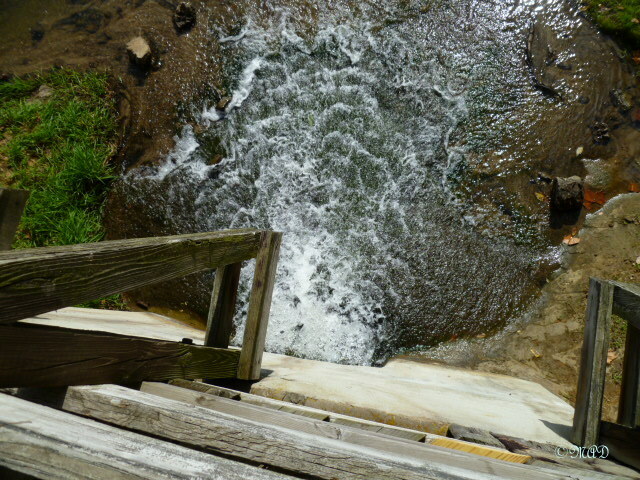 Looking down where the water flows back out of the wheel area. Lovely view looking towards the Mansfield bridge. 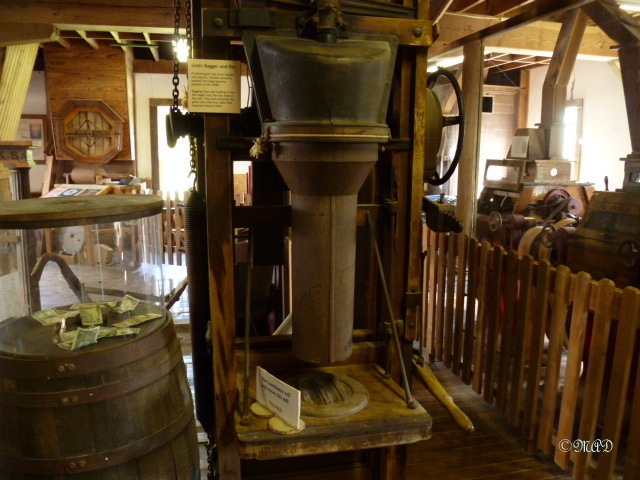 A chart explaining how turbine power is used to run a grist mill. 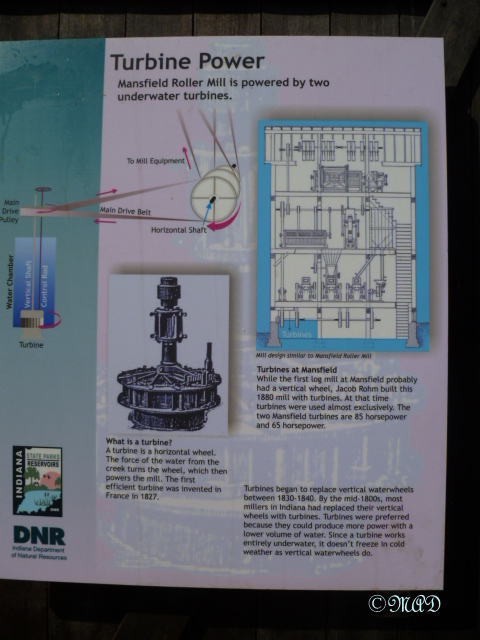 The basement, just above where the water flows through to turn the turbine wheels. Freshly ground grain flour is collected here in bags for the customer. A weighing scale – step right up! 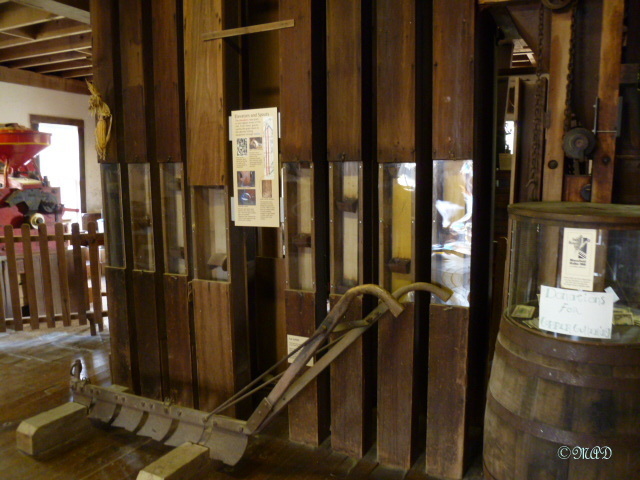 Elevator lift – which carries the ground flour up to the top floor, where gravity makes it possible to bring it down to fill up the bags. 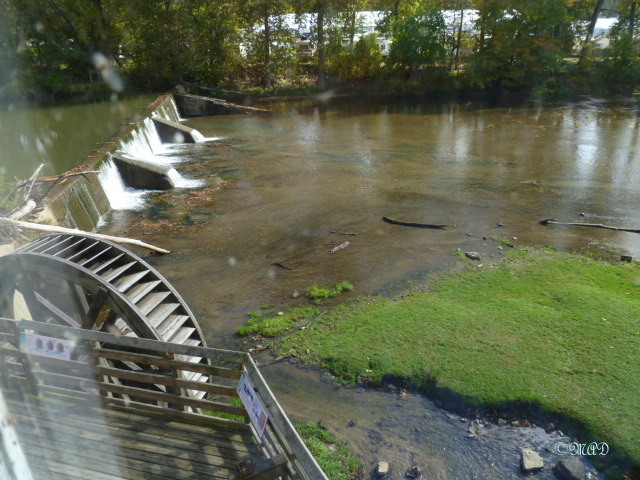 I was able to take some photos of the bridge and the turbine grain mill museum, which was very well preserved, as well as the waterfall and wheel trace behind it. 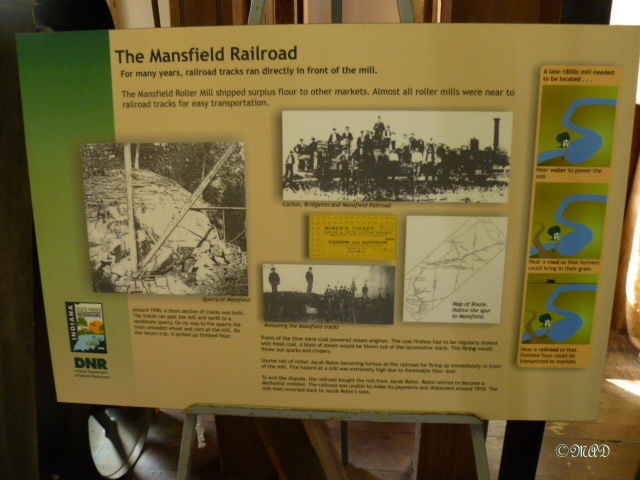 Gallery | This entry was posted in History, Hoosier Land Cooking, Indiana History, Indiana Travel and tagged Autumn, Covered Bridge Festival, Fair Food, Festivals, Grist Mill, Indiana, Mansfield, Mansfield Covered Bridge, October Festivals in Indiana, Parke County, Parke County Covered Bridge Festival, Turbine Wheels. Bookmark the permalink. I love the history of the great mid-west! Many don’t know of it – it is fun to teach about it and learn from it. What a wonderful way to spend an autumn day. 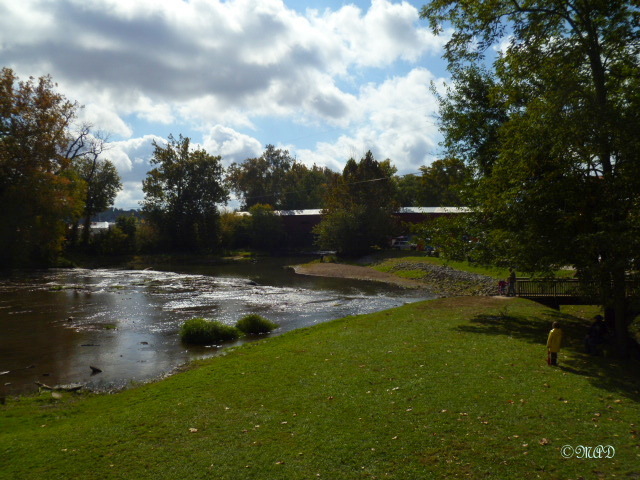 I would LOVE to see the covered bridges and all the festivities surrounding their celebration. 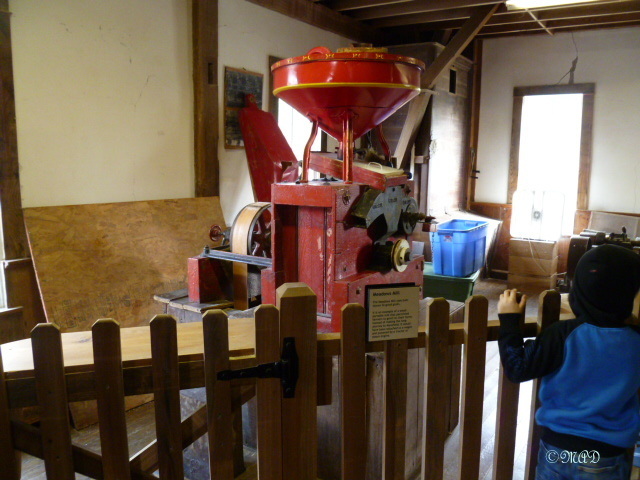 Great review of the workings of the mill too!! Of course, glorious photographs throughout! Thanks Jeff! It is a wonderful way to spend an Autumn day! My brother in law however is crazy for them and protests every time we threaten to cut the trees down, haha. Oh, are they sour in Indiana? They are mushy and sweet here but more mushy and tasteless if you ask me. Yes, they tend to be sourish here, from what I remember.